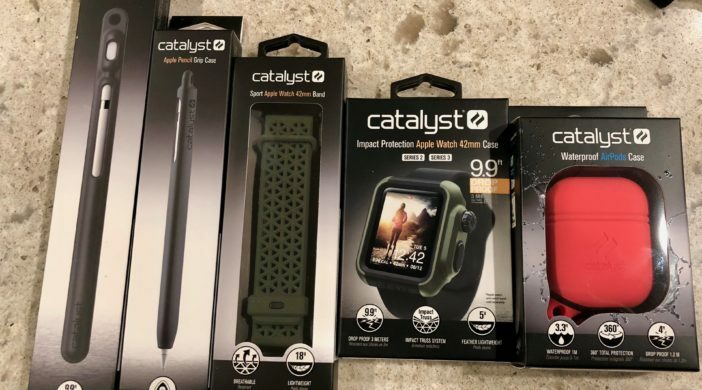 Catalyst Products are shields, cases and watch bands made to protect your Apple Watch, Apple Pencil and AirPods. Catalyst specializes in protecting your devices from drops and the elements. 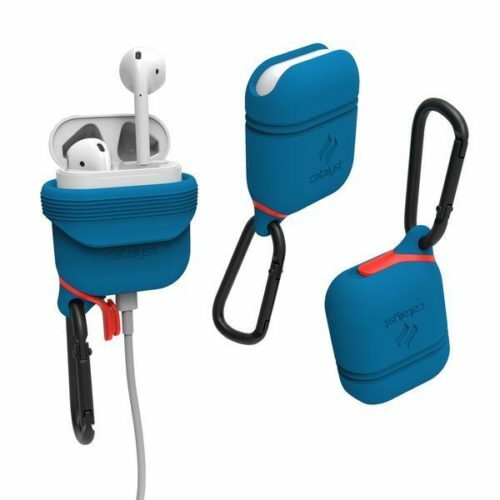 The Waterproof Case for AirPods comes in six colors and protects the case from drops and water while allowing you to use and charge the AirPods. The Grip Case for the Apple Pencil is used to protect the pencil while using and the Carry Case is used to store and protect the pencil. The Impact Protection Case and Watch Band are both to protect and accessorize the Apple Watch 2 or 3. Catalyst products are all packaged well and come with instructions either in the box or on the back of the box. The Waterproof Case, Grip Case for Pencil and Pencil Case all come with a belt clip. Catayst’s website has many other protectors for other Apple products. 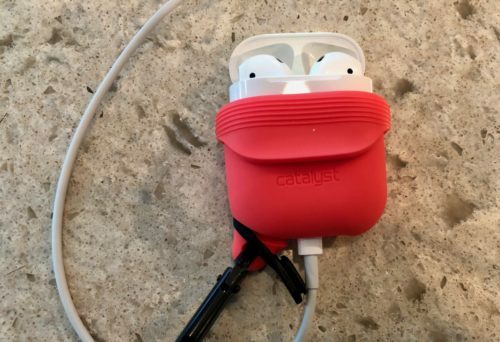 Our Reviews Editor uses and recommends Catalyst protection for iPhones, including iPhone X. The Waterproof Case for AirPods is a one piece rubber case with a removable tab on the bottom for charging. A belt clip attaches to the side. When not in use or charging, the case becomes sealed and waterproof. To charge, a rubber tab on the bottom comes off to expose the lightning port. The rubber stopper is attached to the case so it won’t go missing. To open the top to get to the AirPods, you need to peel back both side of the top of the case. Its not as elegant as just flipping the top open, but if you don’t want your case to get wet or damaged, this is the way to do it. Both the Grip Case and Carrying Case for the Apple Pencil enclose the pencil and the Lightning to Lightning charging adapter. The Carrying Case has a spot in the top for the adapter while the Grip Case has a separate holder for it. Both cases come with a belt clip and the separate holder for the adapter can attach to the clip. The cases are very similar in appearance except the Grip Case is designed to be used while using the pencil while the Carrying Case is for the pencil to be stored in. Both are attractive black rubber and gives the pencil a nice look. These two cases can not be used at the same time, so it’s one or the other. Catalyst carries many products to protect and accessorize the Apple Watch. The Watch Case is a snap-on shield that goes over the front of the watch. Buttons are added on the side to give you access to the controls. The case looks rugged and the controls work fine while using. It gives the watch a bit of a military look. While this will protect the front from scratches, it doesn’t add any other protection. However, Catalyst does offer a full case for the watch. 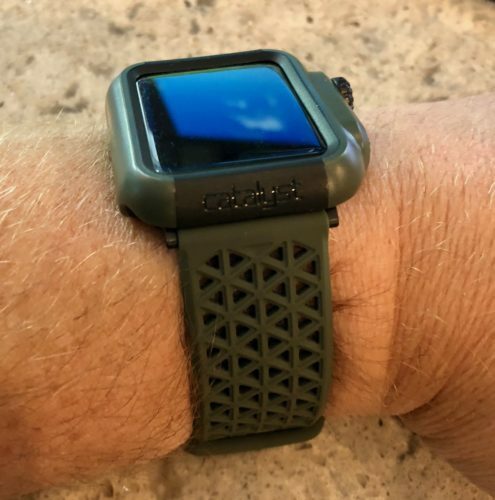 For the full Catalyst look, you can add a watch band that is offered in many colors and different designs. 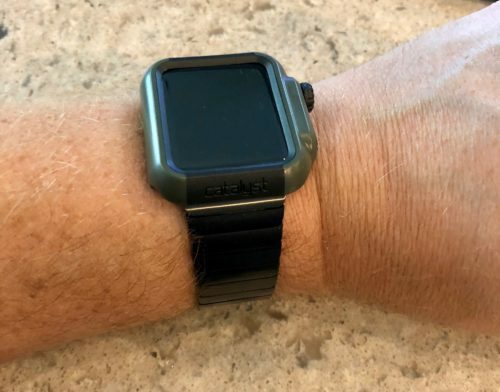 The rubber is comfortable and the review unit I received has removable clasps so you can use it with or without the full body watch shield. Catalyst products all carry the same theme, robust military grade protection. Most of the products look the part while keeping them simple to use, attractive and comfortable. I’m not sure what the material is made of, but I can describe it as soft and durable rubber. These are the types of products that make you want to climb a mountain or swim in the sea with your gadgets on. 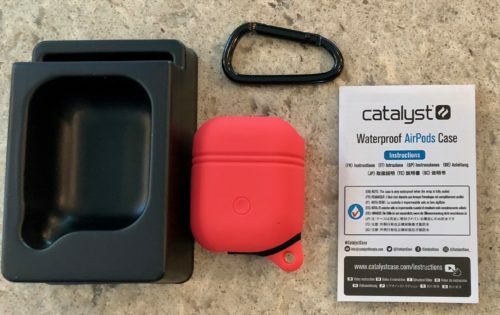 The fact that there are so many different options and configurations at a good price makes the Catalyst gear a no brainer if you need to protect your devices in the elements. MyMac Review Rating is 10 out of 10. Strong, attractive, comfortable device protection at a good price.